Short Details Information: Union Public Service Commission UPSC Are Invited to Online Application Form for the Recruitment Post National Defence Academy NDA in Army, Airfoce, Navy Wing and Naval Academy, 10+2 Cadet Entry Under NDA First Phase Recruitment 2019.Applicants should apply for UPSC NDA Recruitment Online Form 2019 as soon as possible. To get more details of Bihar CSBC Forest Guard Recruitment Online Form 2019 like Education Qualification, Age Limit, Selection Process, Important Dates/Events & other recruitment rules are given below…. 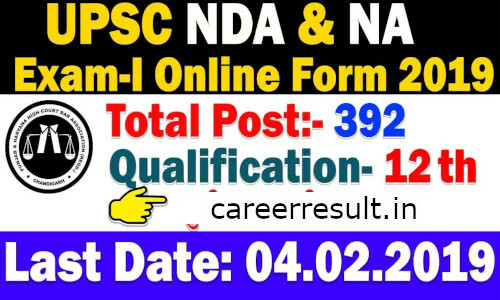 For more detailed info regarding to UPSC NDA Online Form 2019 kindly visit official website and read carefully employment advertisement before applying against to UPSC NDA Vacancy Online Form. Subscribe Careerresult to get latest updates about UPSC NDA Recruitment Online Form 2019 on your smartphone via E-mail. For more latest jobs updates in UPSC Jobs Stay connected with us.All candidates have to request is to share this job link with your friends over at Whats App, Facebook,Twitter,Instagram and help them get good career in your life. The National Defence Academy (NDA) is the Joint Services academy of the Indian Armed Forces, where cadets of the three services, the Army, the Navy and the Air Force train together before they go on to pre-commissioning training in their respective service academies. The NDA is located in Khadakwasla near Pune, Maharashtra. It was established on 7 December 1954. It is the first tri-service academy in the world. The alumni include 3 Param Vir Chakra recipients and 9 Ashoka Chakra recipients. The National Defence Academy (NDA) is an iconic institution, a global brand of excellence in the sphere of military education. National Defence Academy comes up with latest recruitment details on various post based on Education / Qualification for the interview process all over India. Why careerresult.in for UPSC NDA Recruitment 2019 Free Job Alert? Careerresult.in is one of the most informative places for UPSC NDA notification across various sectors and industries within India. Careerresult.in ensures that all the Jobs should be notified to all our visitors. We work 24*7 to update our visitors with latest vacancies. We ensure that all jobs get mentioned on our website. We help both fresher and experienced graduates to get recruitment notification on recent UPSC NDA recruitment 2019 openings across India. Careerresult.in is a primary job website for all types of job recruitment notification. This page is an special page designed for the Latest recruitment notification from UPSC NDA 2019. Careerresult.in team ensures to make you alert about all the recruitment notification and job openings about UPSC NDA jobs. These pages have all vacancies for UPSC NDA recruitment 2019 (recently expired, active and UPSC NDA recruitment notification). UPSC NDA comes up with latest recruitment details on various posts as Civilian Motor Driver, Fire Engine Driver, Fireman, Pilot, Logistics, Naval Architecture, Artificer Apprentices (AA), Submarine Specialization, Engineering Branch and Other Vacancy Post. Careerresult.in is one of the most informative places for UPSC NDA notification across various sectors and industries within India. Careerresult.in ensures that all the Jobs should be notified to all our visitors. UPSC NDA comes up with recruitment notification and recruits many candidates throughout a year. In this page, you can find UPSC NDA recruitment notification that is currently active and also all expired government job openings from UPSC NDA at Careerresult.in. UPSC NDA plans its recruitment process for various posts in major cities across India. Naval Force is available in the following locations – Mumbai, Visakhapatinam, Kochi, New Delhi. This UPSC NDA job page contains all the current and upcoming UPSC NDA recruitment notifications for 2019 across all its locations in India. Golden opportunity for Job Seekers! Do you want to get a job in reputed organization and to grasp high paying Job, Careerresult.in is the basic resource where you can find different Job opportunities in various Companies across India according to your Educational Qualification and experience. Be the First Person to explore this opportunity. Apply for Latest UPSC NDA Recruitment 2019: Here you can find all Latest UPSC NDA Jobs alert. Here you can search for latest upsc.gov.in Recruitment 2019, Jobs in India, online application, employment jobs alert, upsc.gov.in recruitment 2019 openings across India, exam result, vacancies 2019, upsc.gov.in recruitment notification etc. Please read the provided information such as educational Educational Qualification, application fees, selection procedure etc. very carefully before applying for the job. Subscribe to UPSC NDA Jobs and get recruitment notifications on Trainee Scientific Officer vacancies across India through Careerresult.in. Through this page you can find many Job Opportunities on UPSC NDA Jobs Recruitment 2019. With Latest vacancies you can also get upcoming Notifications on UPSC NDA recruitment. Careerresult.in team updated this page as soon as possible. So frequently check this page whenever you want and know about recent as well as forthcoming UPSC NDA Jobs. If you want to apply for any job related to UPSC NDA, you can find every information on Careerresult.in and can apply for the job with essential and right information. Careerresult.in provide you every information like Job description, Eligibility criteria, Last Date for application, Numbers Of Total Posts vacancy, Educational Educational Qualification , Salary, , Job Locations, Application procedure, Application fees, Selection procedure and even Interview Dates of UPSC NDA recruitment 2019. Links for UPSC NDA Official Notification, Online Application Form is provided in this page itself. Careerresult.in gives you easiest way to apply for the UPSC NDA Jobs. Besides UPSC NDA Jobs you can find many other similar Jobs in Top Companies in this page itself. What’s more at Careerresult.in for UPSC NDA Recruitment 2019? At Careerresult.in, you can search and find many Jobs for various streams like 10th, 12th, B.E, B.Tech, M.E, M.Tech, B.Sc, M.Sc, B.Fsc, M.Phil, Ph.D, BCA, B.B.A, MBBS, MS/MD, MCA, B.Com, etc. Career Result shows jobs in many Top Companies for education-wise as well as location-wise and these are updated every minute. We have jobs for you in various locations like New Delhi, Noida, Kolkata, Pune, Mumbai, Chennai, Bengaluru, Hyderabad and more across India. Find Latest job vacancy details first on Careerresult.in. Explore Today’s as well as Weekly updates of Employment News at Careerresult.in, which you can’t find anywhere else. In order to get enrolled in UPSC NDA recruitment drive, Careerresult.in will help you with its resources like placement papers, Aptitude skill test, Interview questions and answers, Current Affairs, etc. So make use of it and clench your dream Company Job. Rojgar samachar on UPSC NDA’s latest recruitment are updated in Careerresult.in daily. Don’t miss this fruitful opportunity. How to get UPSC NDA recruitment 2019 Free Job alert? To know immediately about the UPSC NDA Jobs 2019 and vacancies which are to be announced in the near future, you can subscribe to our Careerresult.in Free Job Alert to your Email. Surely you can get instant alerts related to upcoming UPSC NDA recruitment 2019. The future depends on what you do today. Grow with the world of info.student@careerresult.in. Best wishes for all your future endeavors.